Mike Fiechtner Photography || Seattle Wedding, Family and Senior Photographer — Perfect timing! There are certain times during the day that I wish I had my camera! I knew the perfect shot would present itself.....and I'm bummed out when I don't get a shot because my camera is at home. And then there are other times that you just seem to have perfect timing. I scour flickr and find all of these photos that people take and I can tell that they were there at the perfect time. I have to continue to learn to be patient and know that I will have those opportunities....and when I do I just have to be ready for them! This photo is a perfect example of that lucky timing. 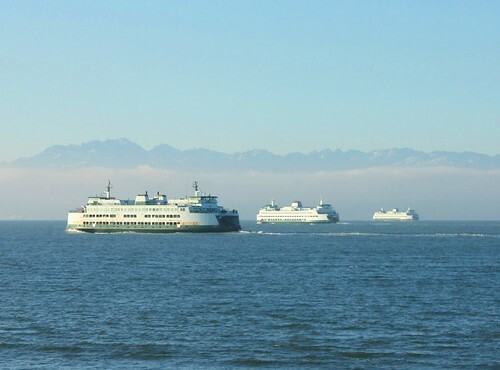 I was down on Alki taking some photos of downtown and and I was continuing to drive along Beach Drive on my way home when I noticed these 3 ferries about to cross paths. I quickly stopped the car, jumped out and took a couple dozen shots of the ferries with the mountains poking out of the low clouds. I was a little frustrated because I had my 18-55mm lens on my camera and didn't have time to switch to my telephoto lens. So I did crop this photo quite a bit and is therefore not as sharp as I had hoped. Oh well, I'm happy that I got this shot regardless. Enjoy!